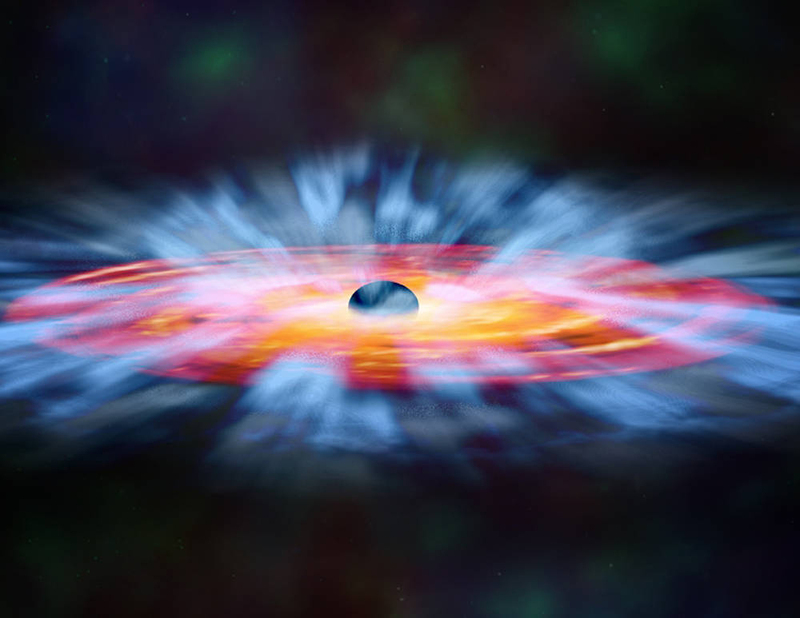 TORONTO, March 21, 2016 - New research led by astrophysicists at York University has revealed the fastest winds ever seen at ultraviolet wavelengths near a supermassive black hole. "We're talking wind speeds of 20 per cent the speed of light, which is more than 200 million kilometres an hour. That's equivalent to a category 77 hurricane," says Jesse Rogerson, who led the research as part of his PhD thesis in the Department of Physics and Astronomy at York U. "And we have reason to believe that there are quasar winds that are even faster." Astronomers have known about the existence of quasar winds since the late 1960s. At least one in four quasars have them. Quasars are the discs of hot gas that form around supermassive black holes at the centre of massive galaxies - they are bigger than Earth's orbit around the sun and hotter than the surface of the sun, generating enough light to be seen across the observable universe. "Black holes can have a mass that is billions of times larger than the sun, mostly because they are messy eaters in a way, capturing any material that ventures too close," says York University Associate Professor Patrick Hall, who is Rogerson's supervisor. "But as matter spirals toward a black hole, some of it is blown away by the heat and light of the quasar. These are the winds that we are detecting." Rogerson and his team used data from a large survey of the sky known as the Sloan Digital Sky Survey to identify new outflows from quasars. After spotting about 300 examples, they selected about 100 for further exploration, collecting data with the Gemini Observatory's twin telescopes in Hawaii and Chile, in which Canada has a major share. "We not only confirmed this fastest-ever ultraviolet wind, but also discovered a new wind in the same quasar moving more slowly, at only 140 million kilometres an hour," says Hall. "We plan to keep watching this quasar to see what happens next." Much of this research is aimed at better understanding outflows from quasars and why they happen. "Quasar winds play an important role in galaxy formation," says Rogerson. "When galaxies form, these winds fling material outwards and deter the creation of stars. If such winds didn't exist or were less powerful, we would see far more stars in big galaxies than we actually do." The team's findings were published today in the print edition of the Monthly Notices of the Royal Astronomical Society. This research was done in collaboration with scientists at Humboldt State University, Pennsylvania State University, and Erciyes University (Turkey). It was supported by the National Science and Engineering Research Council of Canada, Government of Ontario, TUBITAK (Turkey), and the National Science Foundation (USA). Please note: Jesse Rogerson is available by phone, Face Time or Skype. York University is known for championing new ways of thinking that drive teaching and research excellence. Our 52,000 students receive the education they need to create big ideas that make an impact on the world. Meaningful and sometimes unexpected careers result from cross-discipline programming, innovative course design and diverse experiential learning opportunities. York students and graduates push limits, achieve goals and find solutions to the world's most pressing social challenges, empowered by a strong community that opens minds. York U is an internationally recognized research university - our 11 faculties and 24 research centres have partnerships with 200+ leading universities worldwide.